Review of Singer XL-580 Futura Embroidery Machine - Good or Bad? Unleash your inner creativity and love for embroidery with the new Singer XL-580 Futura Embroidery. Embroidery and stitches possibilities are truly endless and unique. All its features are innovative and very helpful. Keep reading this singer XL-580 Review to know if it’s a best fit for you. 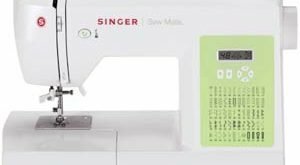 Why Choose Singer XL-580 Futura Embroidery? With hundreds of built-in embroidery and stitches, you can create any design for any fabric. Whether you are working on small projects or big ones like quilt, bed sheets and curtains, you can count on this machine. 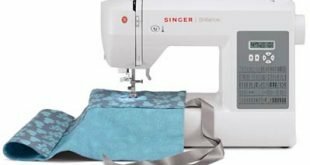 All aspects of the new Singer Futura are well thought out and installed to make sewing as fun and less hassle as it should be. This sewing machine does not have any unnecessary and redundant features. 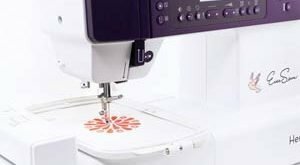 You will love the 250 built-in embroidery designs that come with this new sewing machine. Fifty (50) of these are endless designs that you can use for continuous patterns in bed sheets, curtains and others. This machine also comes with hundreds of built-in stitches, including block letters and numbers. Working with big fabrics will not be a problem either because of the Long Arm Design. This gives bigger space for easier movement and lesser difficulty. Too busy in the day, working at night is also not an issue with 6 StayBright LED lights for a well-lit working space. You can connect it with your computer using the USB key and make use of the bonus software. AutoPunch™ and HyperFont™ make it possible to transform images and all fonts to embroidery. While another software, Advanced Editing will allow you to change existing embroideries. You will not waste another time with the new features – Drop & Sew Bobbin System, SwiftSmart Threading System, and Electronic Thread Trimmer. Who Should Use Singer XL-580 Futura Embroidery? Singer XL-580 Futura Embroidery is perfect for people who love embroidery. Whether you are an intermediate or professional sewist, you will definitely like this sewing machine. The unique and innovative features are very useful and make sewing enjoyable and without difficulty.